The TARDIS shows up in Second A.D. Scotland. Bill (Pearl Mackie) wants to find the lost Ninth Legion of the Imperial Roman Army. She has read up on them and has an interest in them. Bill: “I got an A star!” The Doctor (Peter Capaldi) doesn’t think it is that much of a mystery; they died. Nardole (Matt Lucas), in his bright orange bathrobe, thinks they should be back in the present guarding the vault. Bill is excited to search for them, so they stay. Bill goes towards the river to find the missing legion while Nardole and the Doctor head the opposite direction to find the dead bodies. Something is watching Bill from the distance. Bill comes upon a Pict woman (Rebecca Benson) mourning her lost ones. Bill says hi and the woman named Kar chases her. Bill falls down a hole; a Roman soldier motions her to be quiet. The Doctor: “Well, of course it did. It’s a crow. All crows talk.” Nardole: “Well, they don’t talk in the ‘future’!” The Doctor: “Of course they do. Human beings just stopped having intelligent conversations with them, and they all took a bit of a huff.” Nardole: “Crows in the future all in a huff?” The Doctor: “Of course they are! Haven’t you noticed that noise they make? It’s like a mass sulk!” The Doctor spots a Cairn. The Picts think they are doors between worlds. The Doctor finds the bodies of the Ninth Legion. Something killed them taking sunlight out of their bodies. Whatever killed them was alien. Now they have to find Bill. A group of Pict warriors surrounds them. The Roman soldier tells Bill a monster killed the Ninth Legion. Only a few who ran from the monster are alive. He and Bill will meet up with the rest of the survivors. As they set out the creature grabs him with its long tentacles. Bill runs into a cave where the surviving Roman soldiers are. The creature nearly grabs her, leaving some of its slime on her arm. The Romans soldiers fight the creature off and close the entrance. They want to know who she is. She tells them their friend has died. Bill faints from the touch of the creature. The Doctor enters the cairn and finds out it is an interdimensional portal. He sees the dimension where more of the eaters of the light creatures live. The Doctor walks out of the cairn, he thinks he was only in there a few seconds. Nardole (who has gone native, with the markings of the tribe on his face) tells him he was gone for two days. He thought the Doctor wasn’t coming back. He has spent the last two days looking for Bill and he is afraid she is lost. The Doctor won’t accept that, he and Nardole will continue looking for her. The Roman soldiers have been taking care of Bill. They exposed her to sunlight to let the creature’s slime burn off her. Bill realizes she can understand them speaking Latin and they can understand her speaking English. She realizes the TARDIS has enabled her to understand other languages in the universe. Lucius (Brian Vernel), the leader of this little band has taken a liking to Bill. She tactfully explains she is a lesbian and that she only dates women. He is okay with that and he is glad she knows what she likes. He dates both men and women, and he thinks it is sweet that she is so restricted in her sexual practices. The Doctor runs into Kar. Her job as the gatekeeper is to defeat one of the eaters of the light, preventing it from getting out of the cairn. She let one of the creatures out to defeat the invading Roman army. The Doctor: “So, you thought the Eater of Light could destroy a whole Roman army.” Kar: “It did!” The Doctor: “And a whole Roman army could weaken or kill the beast.” Kar: “Yes.” The Doctor: “Well, it didn’t work! You got a whole Roman legion slaughtered, and you made the deadliest creature on this planet very, very cross indeed. To protect a muddy little hillside, you doomed your whole world.” The Doctor informs her there are more of those creatures out there. They could enter our world and destroy it. The Doctor tells Kar to grow up; it is her responsibility to stop them. Bill tells Lucius and his men that they need to find the Doctor. He helps those who are scared and desperate. They think she is calling them cowards. Bill assures them she isn’t. Bill: “You’re not cowards. You’re scared. Scared is fine”. She is going to find the Doctor; she asks them to join her. She can’t guarantee they won’t be killed, but at least they won’t die in a hole in the ground. The Doctor’s plan is to lure the beast back into the cairn while it is still weak and seal the creature in it. He will need Kar’s help. She is scared; the Doctor thinks that is okay. He tells her she can’t be thinking about the deaths she might have caused, she has to confront her beast. Bill and the Romans leave their hiding place; the creature kills one of the Roman soldiers when he tries to run from the group. Bill and the Romans climb up a ladder and end up in the same location the Doctor and the Picts are. The Doctor is relieved to see Bill and she is happy to see the Doctor and Nardole. She tells them she found the Ninth Legion. The Romans and Picts aren’t happy to see each other since they draw their swords and spears on each other. Bill realizes the Romans and Picts can understand each other because of a telepathic field the Doctor is creating for them. She turns to the Doctor and says, “Is this what happens? You can understand what everyone in the universe is saying, everyone just sounds like children?” The Doctor explains to the gathering that the creatures are like space locust. They eat light. If they get through the portal, they’ll eat the sun, eventually all the stars. The Romans killed the Pict’s families; Kar killed the Romans with the creature. They have to put that aside, they have one enemy they all have to fight. The Doctor shouts at the young Roman soldiers and young Pict warriors to all grow the hell up. He knows they are scared, but luckily, for them he has a plan. I would wager if they showed the same creature in another episode in a few years, no one would remember they saw it in this episode. This week’s episode is very similar to last week’s episode. Last week they went to Mars where an invading army (the British army) confronts the local warriors, the Ice Warriors. Bill falls down a shaft. Eventually the Doctor gets the two armies to stop fighting. The episode ended with a scene between the Doctor and Missy in the TARDIS. This week, they go to ancient Scotland, where an invading army (the Roman Ninth Legion) confronts the local warriors, the Picts. Bill falls down a hole. Eventually the Doctor gets the two armies to stop fighting. The episode ended with a scene between the Doctor and Missy in the TARDIS. I liked the episode last week, and I like this one too. Both weren’t all time great episodes, but they were entertaining. It would have been better if the two episodes weren’t back to back. This episode felt like it should have been shown earlier in the season, without the epilogue with the Doctor and Missy attached to it. Finding out about the TARDIS, language system seems like something Bill should have already discovered. The creature was all right, but it isn’t a memorable creature. I would wager if they showed the same creature in another episode in a few years, no one would remember they saw it in this episode. What made this episode stand out was Bill taking charge. She was able to rally the Roman soldiers on her own. She did figure out the TARDIS and the Doctor’s telepathic field helping everyone understand each other. With the Roman soldiers and Kar all being so young, it was interesting Bill realizing that all of them sound like children asking for help. To the Doctor, that must be how we sound to him all the time. 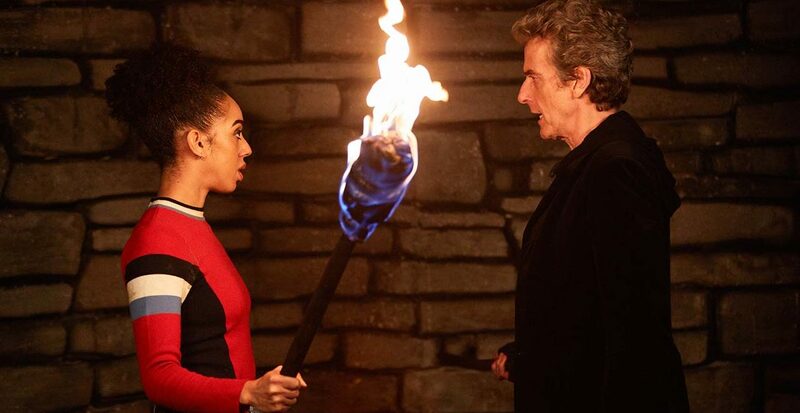 The interactions between Pearl Mackie and Peter Capaldi were stellar again, and I really enjoyed Matt Lucas. He was funny without it being out of place. The epilogue scene between Capaldi and Michelle Gomez sizzled. It nicely sets us up for the final two episodes for the season. That makes me sad.